Basically, using the Microchip MGC3130 it supports 3D gesture detection – for example, swipes and flicks – at distances of up to 10cm, potentially providing a more flexible user experience. It’s made by the Pi specialists Pi Supply and is priced from £17, from the distributors such as RS Components and now Farnell. This actually comprises a kit, the contents of which include the Flick HAT itself, plastic bolts, plastic spacers, stickers and information cards. Integrate Flick into your Raspberry Pi project to give you multiple ways of controlling it. 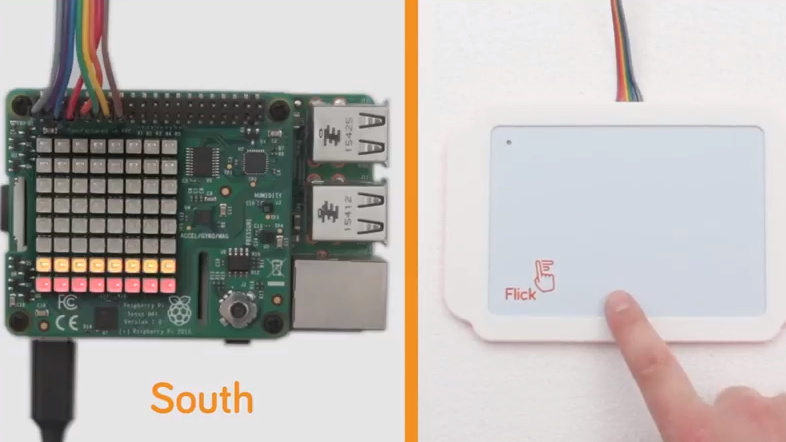 Using the near field gesture technology, you’re able to hide your project behind non-conductive material (such as wood/acrylic) and still use Flick (please note however that mounting it in this way may reduce the sensor range). We’ve designed the Flick range to be plug and play, allowing you to be up and running within minutes. Use our software libraries (complete with one line installer) to fully explore what you can do with Flick. Control your computer, TV, music system and more all with a Flick of the wrist! The Raspberry Pi Flick HAT Case is priced at £13 including VAT. Temperature Range: -20? to +85? For even more technical details, such as open source code for its operation, check out the ocmpnay’s GitHub page.